For the Sonic Drift 2 level, see Hill Top (Sonic Drift 2). 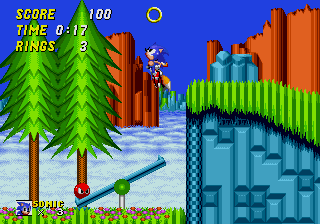 Hill Top Zone is the fifth zone in Sonic the Hedgehog 2, featuring extended level blocks such as Star Light Zone's start loops and Green Hill Zone's spin tubes. The stage features lava pits and underground caverns, similar to Marble Zone. However, Hill Top features no sturdy ruins of long-gone civilizations; they would have been ground to dust by the frequent earthquakes which ravage the zone and fill the chthomic spaces with scorching magma - often while Sonic is inside. Outside, pine trees rise over a landscape of blue-tinted rocks, with rickety vine chairlifts connecting one peak to another. See-saws and loop-the-loops are scattered throughout the zone; while the latter springs our heroes up the mountainsides, the loops invariably send Sonic and Tails cannoning into the volcanic caves. Geographically, the Zone is located amidst the high peaks of West Side Island. It can actually be seen from Emerald Hill Zone; the vertiginous ridges of Hill Top's background glimpsed on the horizon at the far right of the first stage. A slightly modified version of Hill Top Zone's art is also used in Emerald Hill Zone, with different coloration. No one knows why for sure, but Emerald Hill Zone and Hill Top Zone were developed during the same time which can be proven by playing the Nick Arcade prototype and Simon Wai prototype where they are both completed. Rexon - Plesiosaur enemy, sits in lava and throws fireballs at you. Once destroyed, its body can be used as a platform to stand on. Spiker - Cone enemy, launches its cone at you when you jump over it or walk under it. Sol - Spherical enemy, surrounded by 4 fireballs which it throws at you. Referred to as "Sol" in the instruction manual, and "Ghora" in Sonic Jam.